With the NCAA Tournament gearing up again tomorrow and almost everyone checking their brackets, I thought I'd honor the only hope I have of winning my pool. Since Davidson decided to completely own Georgetown, I am in trouble. See I had the Hoyas winning the whole thing. However, I did so well in the first round, 28 of 32 games, I still have to chance to win. The only way that happens is if Texas makes it to the championship game. 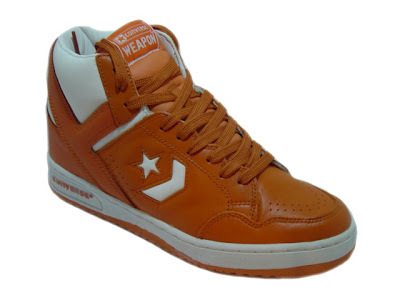 I thought this might be a good time to show some Texas love and share a photo of a Texas Orange pair of Weapons. I am really impressed with the votes that we've seen on the poll, hopefully they will continue. Thanks for taking a minute to check out The Converse Blog, and remember Hook'em Horns!